In recent years, there has been a major shift in the fashion industry toward a more nimble and flexible business model that brings products to market much faster than ever before. "Fast-fashion" brands like H&M, Forever 21, and Topshop are meeting consumer demands for clothing and accessories that are both trendy and cheap. They are able to capitalize on current fashion trends and consumer tastes and bring those designs into stores in about half the time of traditional retail brands. It turns out that these brands are also ahead of the curve when it comes to influencer marketing and understanding how to best target and engage with their younger-skewing consumers. 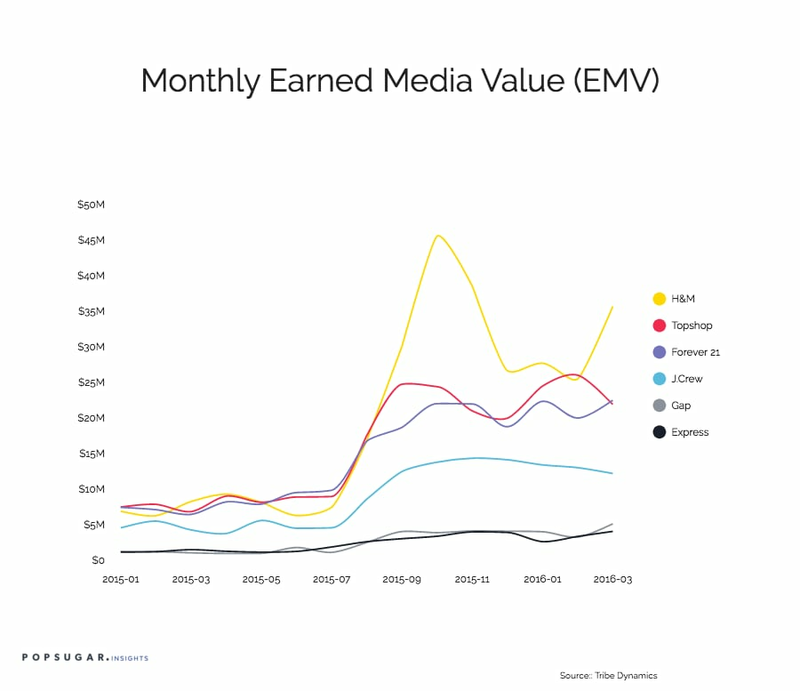 We analyzed Earned Media Value (EMV) data from over 75,000 influencers for 60 brands in the style category during the 15-month period of January 2015 through March 2016. The data was provided by our partner in the influencer space, Tribe Dynamics. For those not familiar, Earned Media Value is a tangible way to quantify the value of social conversations about your brand. Of these 60 brands, we looked at three fast-fashion brands and three more traditional retail brands. H&M is ranked fourth in overall EMV, Topshop is eighth, and Forever 21 is ranked 11th. In the second half of 2015, H&M intensified its influencer marketing efforts, working with celebrities such as Ashley Tisdale and Katy Perry. The results were impressive, with total EMV across all social channels increasing by over 100% from Q3 to Q4. Forever 21 and Topshop experienced less dramatic boosts in EMV during the second half of 2015, increasing by 39% and 28%, respectively, between Q3 and Q4. Topshop's Fall 2015 campaign featured American fashion model Gigi Hadid, while Forever 21's Fall "Forever You" campaign showcased up-and-coming models. Looking at the source of EMV for these retail brands, there are some clear differences between the fast-fashion and more traditional retailers. 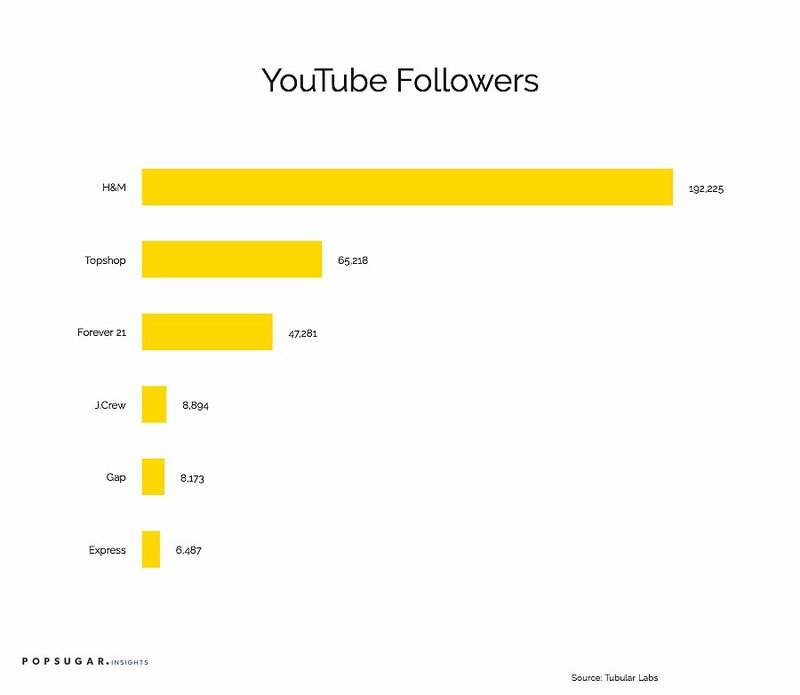 Forever 21, Topshop, and H&M generate a much higher percentage of EMV from YouTube than Gap, J.Crew, and Express. 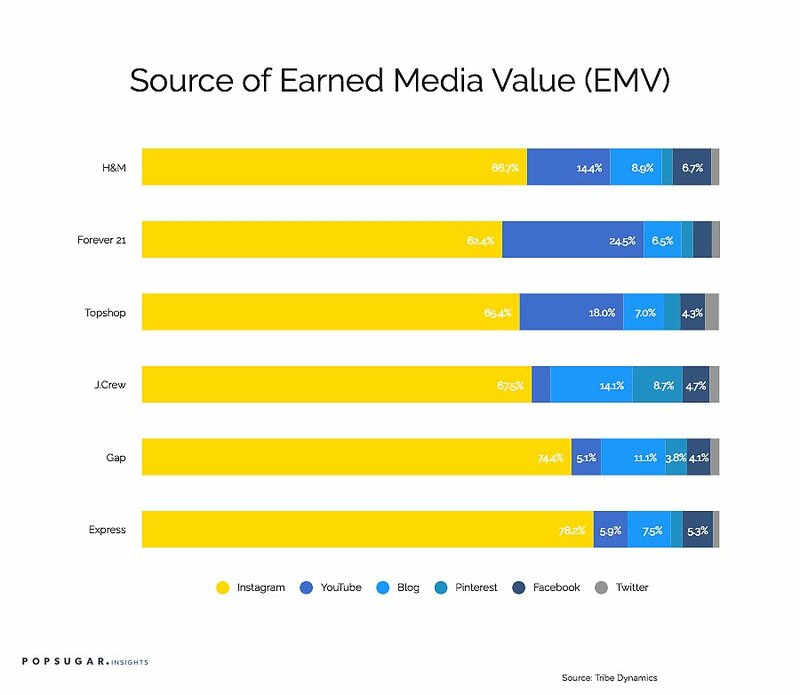 This speaks volumes about how video is becoming an increasingly important social currency for brands that are looking to resonate with Gen Z. Twenty-four percent of Forever 21's EMV comes from YouTube, compared to only 3% of J.Crew's. In contrast, Gap and J.Crew rely more heavily on blogs for their influencer marketing campaigns. Taking this a step further with video data from Tubular Labs, it is clear that a focus on video for fast-fashion brands has resulted in a much larger following on YouTube, thereby establishing a broader base for future campaigns. H&M has nearly 200,000 followers and 100M lifetime video views on YouTube. As highlighted in a recent POPSUGAR Insights post on the same topic, Instagram is the dominant source of EMV for most brands, but many brands might be over-reliant on Instagram. As demonstrated above, the fast-fashion brands have generated significantly more EMV in recent months than more traditional retail brands. While each brand has to take into consideration its own business strategy and target consumers, from this sample of retailers, we can conclude that a balanced cross-platform and video-centric approach to influencer marketing can pay dividends.